The conference proceedings, including the three keynote lectures, responses by Turkish scholars, and a transcript of audience questions and panel discussions, were published in English in METU Studies in Development, vol. 22, no. 3, 1995. I am pleased to belatedly discover that my lecture, along with those of John Hall and Paul Langford, has appeared in Turkish translation in Huri Islamoglu (ed. ), Neden Avrupa Tarihi (Istanbul: Iletisim Yayincilik, 2nd ed, 2014). I like the cover too. The simple questions are: first, what is Europe? Second, where is the West? And third, when was modernity? My 1986 book with David Frisby, Society, has coincidentally also just appeared in Turkish under the title Toplum. The same publisher previously did a Turkish edition of The Violence of Abstraction. Given the appalling repression going on in Turkish universities since the failed coup in 2016, it is heartening that such texts are still being published. 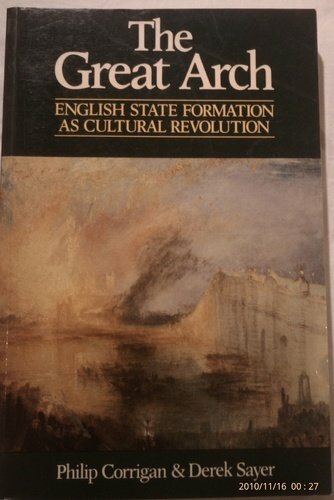 Blackwell issued a 2nd edition of The Great Arch in 1991, six years after the original publication, for which Philip Corrigan and I wrote a postscript discussing new work on English state formation published since 1985, and responding to various reviews of the book. Both entailed some clarification and extension of its arguments. The 2nd edition had a very small print-run and soon went out of print, so this text is little known. The excellent cover illustration is from Lyubov Popova’s set for The Earth in Turmoil (1923). I have posted a downloadable scan of the postscript here for anyone interested. There was also a Spanish translation of the Introduction and Afterthoughts sections of The Great Arch, in Antropología del Estado: Dominación y prácticas contestatarias en América Latina, ed. María L. Lagos and Pamela Calla, Cuaderno de Futuro Nº 23, La Paz (Bolivia): Hernando Calla, 2007, pp. 39-116. A pdf can be downloaded free here. Earlier this year New Perspectives published an updated version of a paper I had been working on—on and off—for more than a decade, in which I tried to re-examine some of the arguments about English state formation presentein my 1985 book with Philip Corrigan, The Great Arch, in light of my later work on Czech history in my Prague Trilogy. Considering the differences between the superficial orderliness of the English/British table of royal succession and the apparent anarchy of its Bohemian counterpart, this essay questions aspects of the analysis of English state formation offered in Philip Corrigan and Derek Sayer’s 1985 study The Great Arch: English State Formation as Cultural Revolution. Rather than providing a contrast to England’s institutional political continuities over centuries, Bohemia’s manifestly fractured history furnishes a vantage point from which the ideological character of such claimed historical continuities becomes clear. E. P. Thompson’s image of a “great arch” of state formation attributes far too much shape, solidity, and coherence to a process that was always, whether in England or Bohemia, a matter of flux and fluidity – a landscape in constant erosion, upon which coherence is only ever imposed in momentary retrospect. New Perspectives has just made the text freely downloadable here. I would welcome any comments.